Vadodara (Gujarati pronunciation: [ʋəˈɽodəɾɑː]; formerly known as Baroda) is the third-largest city in the Indian state of Gujarat, after Ahmedabad and Surat. 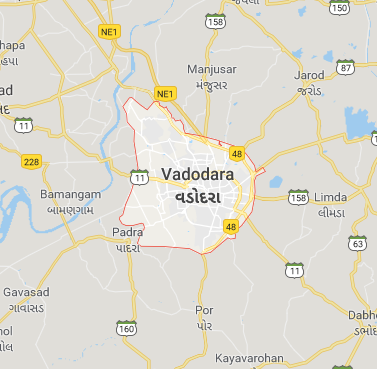 It is the administrative headquarters of Vadodara District and is located on the banks of the Vishwamitri river, 141 kilometres (88 mi) from the state capital Gandhinagar. The railway line and NH 8 that connect Delhi and Mumbai pass through Vadodara. It is known as a Sanskari city of India. As of 2011, Vadodara had a population of almost 2.065 million people. The city is known for the Lakshmi Vilas Palace, the residence of Baroda State’s Maratha royal family, the Gaekwads. It is also the home of the Maharaja Sayajirao University of Baroda, the largest university in Gujarat. An important industrial, cultural and educational hub of western India, the city houses several institutions of national and regional importance while its major industries include petrochemicals, engineering, chemicals, pharmaceuticals, plastics, IT and foreign exchange services.